“California wildfires are being magnified & made so much worse by the bad environmental laws which aren’t allowing massive amount of readily available water to be properly utilized,” Trump wrote. Nunes, who has been a critic of California’s environmental laws for years, wrote a message on Twitter thanking Trump for bringing attention to the problem. Around 70 percent of the water that enters the Sacramento-San Joaquin River Delta is flushed into the ocean due to environmental regulations and a lack of water storage capacity. According to Nunes, both problems are the work of California’s extreme environmentalists. “Working in cooperation with sympathetic judges and friendly federal and state officials, environmental groups have gone to extreme lengths to deprive the San Joaquin Valley, the heart of much of the U.S. agricultural production, of much-needed water,” Nunes wrote in an opinion for Investors Business Daily. According to Nunes, the environmentalists’ long-term goal is to remove 1.3 million acres of California farmland from production. They have achieved this through incremental legislative victories, years of litigation, and state regulations. In 1992, Congress passed the Central Valley Project Improvement Act, which annually diverts 260 billion gallons of water from the west Joaquin valley to environmental causes. An additional 130 billion gallons of water is diverted to wildlife refuges. In 2006, agricultural organizations agreed to settle a 1988 lawsuit filed by environmental groups. Congress approved the settlement and President Barack Obama approved it. The settlement resulted in major additional water diversion from farmlands. In 2008 and 2009, lawsuits filed by environmental groups forced the U.S. Fish and Wildlife Service and the National Marine Fisheries Service to issue biological opinions on smelt and salmon. “These opinions virtually ended operation of the Jones and Banks pumping plants—the two major pumping stations that move San Joaquin River Delta water—and resulted in massive diversions of water for environmental purposes,” Nunes wrote. The San Joaquin River Restoration Settlement would be considered a success if 500 salmon returned to the river, costing taxpayers $4 million per fish, according to a documentary by the National Alliance for Environmental Reform. Farmers and towns in the valley lose 65 billion gallons of water per year as a result. As surface sources of water were increasingly cut off by the government, farmers turned to groundwater supplies. But the environmentalists, aided by California Gov. Jerry Brown, reached underground as well. In 2014, under the guise of “groundwater sustainability,” Brown approved regulations limiting how much groundwater farmers can use. In an Aug. 6 Twitter message, Trump called on Brown to take action. Nunes has outlined a three-step solution to the problem: return pumps to normal operations, fix the San Joaquin River Settlement, and expedite and approve construction of new water projects. 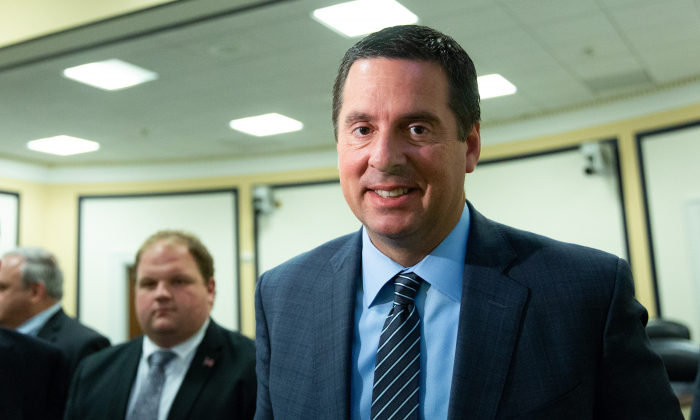 “These measures would not only end the water crisis, they would improve the environment for fish and wildlife—all while saving taxpayer dollars,” Nunes wrote.